You know they are true frugal friends when they agree to be part of your upcoming vlog showcasing our fabulously frugal finds (without any advanced warning). You know they’re the BEST EVER frugal friends when they stand by your side even though they KNOW that bedlam follows where ever you go. You know they’re fabulously frugal friends when both show up wearing amazing outfits unsolicited…(and yes, all bought second hand). You know they are frugal friends when Leah (on the right) made trash to treasure a reality with her spray painted GW bracelet. What began as a nasty $0.99 tacky, orange, 80’s wooden monstrosity turned into a sleek modern accessory by spray painting it blue first and then taking an antiquing glaze over the top and wiping off the excess. You HAVE to love that kind of frugal friend that can think outside the box. Do you have any frugal friends that join you in this crazy journey of Living Well…on less? I am SO glad that I do. Not exactly frugal friend: but the ladies I’ve met at the little local thrift shop are always sweet when I see them in public. Sadly, one of my best friends had a terribly neglected childhood. Since thrift store clothing was the only thing she received as a child, she rejects any thought of secondhand clothes. Through her own efforts, she got a degree, and helped her husband achieve his PhD — she doesn’t have a problem with secondhand books! Another friend and I live 1200 miles apart. We would share garage-sale finds when we lived near each other. Now, though, we each rejoice to hear what the other found on our thrifting sorties. Sounds like so much fun! I looooove Goodwill-ing. You could have just crashed through the gate with the car. it works in the movies… LOL!!! I would LOVE to have you join me in a frugal fashion shopping spree! Just picked up a leather coat for $7!!! Score!!! My best friend and I love the local thrift store. We live in a really small ski town and people come from all over and then leave their designer clothes at this little shop only open from 10-3 wednesday and friday. We have a great time…not always lucky but then the next time we will hit it big and feel so excited! At christmas we found boxes of vintage ornaments hidden under some boxes and old tableclothes, score! I have several great friends/family who share a love for bargains and thrift shopping as much as I do. However, the best person I have to share it all with is my mom. She taught me almost everything I know and we love to score a fantastic purchase together. She also taught me how to think outside the box. I don’t think we have ever pray painted a bracelet, but that gives me some great ideas. You truly are blessed when you have friends who can enjoy such a simple pleasure with you. Thank you for sharing with us! Looks like yall had a great time with the exception of the cars getting locked in, who knew? My hubby and our children love thrift shopping! With a limited income it allows us to be able to afford other things we would normally have to do without. This is so sweet. Love that bracelet! I have my mom and a couple of friends who find the excitement in thrift shopping like me but most think I am crazy and would rather not do such a thing. They don’t know what they’re missing! Well, my best friends have never had to help me steal my own car, and they have never gone to a single garage sale or thrift store with me, but I can call either of them at midnight because I have to make a run to the ER and either one will come and sleep at my house with my kids. If it were my husband, he would have tried the ditch…. My friend has garage sales with her neighbor and I joined them for a few years till I moved to LA. Our one rule was: nothing, absolutely NOTHING goes back into the house or garage (there were exceptions once in awhile as far as special items). But when we were done, we could fill my van and their cars with everything and take it to a thrift shop that supported battered women. What a fun time we had and then a blessing to be able to share with the store. After we unloaded our vehicles, we would go enjoy lunch together and celebrate a garage sale well done. I am blessed with a mini-van load of friends who love to go out for a day of Goodwills, Thrift Stores and end of season Clearance Racks. We shop namebrand and highend, some areas are definately better than others with finding this sort of thing, ex: the south has barely used winter clothes cause it’s cool for 5-8 weeks, still everyone needs some to get by and “feel seasonal”. I’ve never been thrifting with a friend, but my mum is a fun thrifting partner – when we are not ‘on a mission’ – than she is just too focused to giggle with me! We live 650 miles apart, so she thrifts at her stores with my children in mind and we are very blessed by the wonderful things she finds! My12 year old daughter is getting to be a great thrifter, but we don’t go very often – we should, but it takes energy that I don’t have right now. yes…i have frugal friends who share my love of thrifting. we always call each other when we score something fabulous. yes…i will see you next week. I’m flying in thurs afternoon. My thrifty pals and I keep talking about a grand road trip to San Francisco (90 mi. east of here), including the meatball lunch at IKEA (fabulous — just like my immigrant grandma used to make). 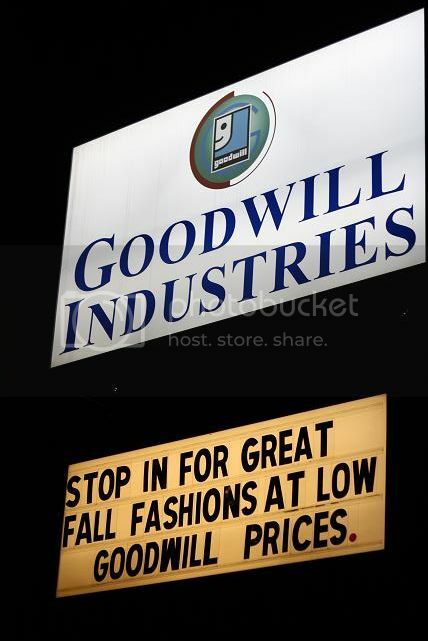 One of my girlfriends says there are some awesome thrift shops there. We’ve yet to do it, but I can dream. My husband will do the architectural salvage places, but not the thrift shops. Picked up a bagful of summer skirts and dresses at the GW by the mall today — never quite make it all the way to the mall…. My size 0 & 5 daughters are a blast to buy for , so I can live vicariously! Mostly they like what I find, which is good, especially since they pay for their own clothes. Sometimes, I have to eat the price of something, if they don’t like it, but if it’s not too fitted, sometimes I can pull it off (OK, ususally not, but I can dream). I love having wacky girlfriends I can get into silly situations with. I can remember being at a Christmas eve bonfire thing on the Mississippi River south of Baton Rouge, and my girlfriends and I realizing we needed a bathroom and there not being any available on the levee. We found a modest spot, but it really showed who went camping and who didn’t… a real learning experience for the city gals. It really says something when everyone finds that hilarious rather than stressful. I have a friend whose in-laws live in Charleston. The Goodwill there is AMAZING! Whenever she wears something awesome, I always say, “Don’t tell me…” and she says, “Yup, Goodwill in Charleston! Yes! I have thrifty friends! A couple of my friends came over in September and we did a clothing swap! I got A LOT of stuff – it was great! It was so fun and we laugh every time we see each other in church in our old clothes that really look quite nice – I’m tempted to ask for them back hehe! Here’s pics of our “clothing swap”. It’s great to have friends like these! I love friends like these. They’re fun, un-inhibited and down to earth. I have had some amazing friends in my life and I can say a good portion of I’ve swayed them to garage sale hopping or thrift store shopping hunts and skeptical they may have been but came out LOVING IT!! They LOCK the parking lot? !